"The online writing classroom" by SusanMarie Harrington, Michael Day et al. Betsy Bowen is a contributing author, “Composition, collaboration, and computer-mediated conferencing”, pp. 129-145. Book description: This book is designed for writing teachers who teach in online environments—primarily networked computer labs and the Internet—and for writing teachers who would like to teach in such spaces. All the contributors write from their own teaching, research, or administrative experience, and all tell their stories in a rich theoretical context that will allow readers to see the relationship between theory, context and practice. The chapters serve as descriptive guides to teaching practices to help the reader find ways to use online activities to further their own pedagogical goals within their own specific contexts. Bowen, Betsy (2000). “Composition, collaboration, and computer-mediated conferencing.” In Michael Day, Susanmarie Harrington, and Rebecca Rickly (Eds.) The online writing classroom. Crescill NJ: Hampton Press. (129-145). 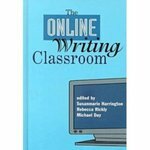 Harrington, SusanMarie; Day, Michael; Rickly, Rebecca; and Bowen, Betsy, "The online writing classroom" (2000). English Faculty Book Gallery. 15.